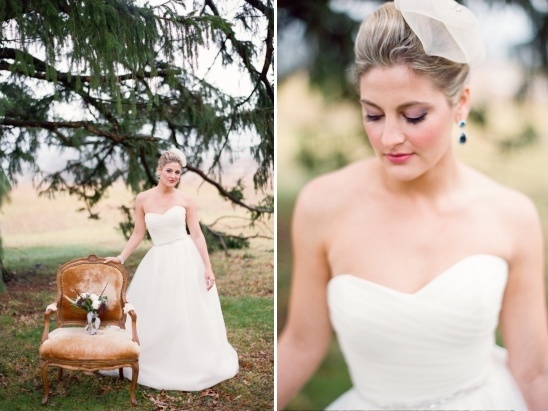 This gorgeous shoot, that took place in a clearing under several evergreen trees at Raspberry Plain in Leesburg, Virginia, will inspire winter brides that don't want their wedding to be Christmas-themed. 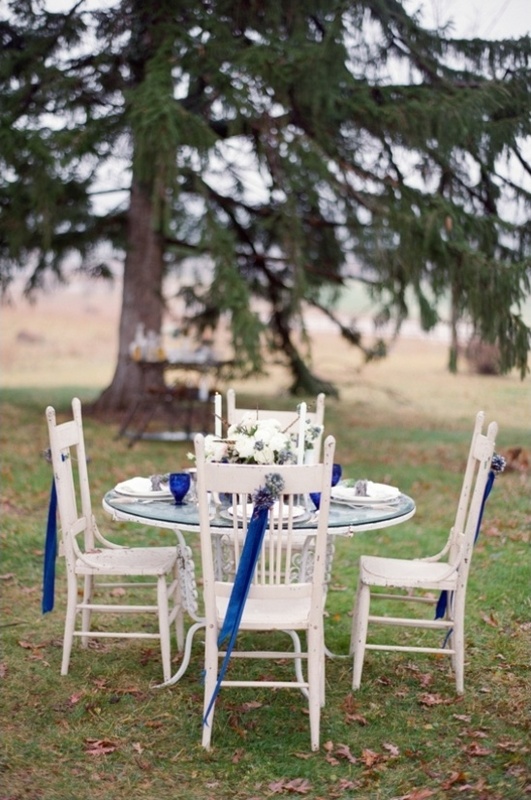 Full of woodsy inspiration, this shoot incorporated vintage glamour with beautiful florals designed by Country Way and vintage decor from Bella Villa Antiques and Vintage Rentals. 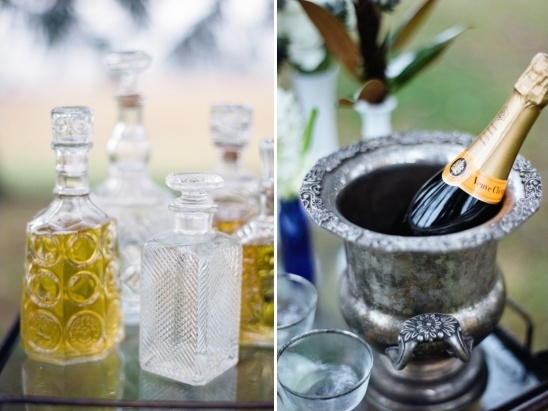 To see all of the beautiful vintage elements of this glamorous woodsy wedding shoot view the full gallery here, all marvelously photographed by Elisa Bricker. 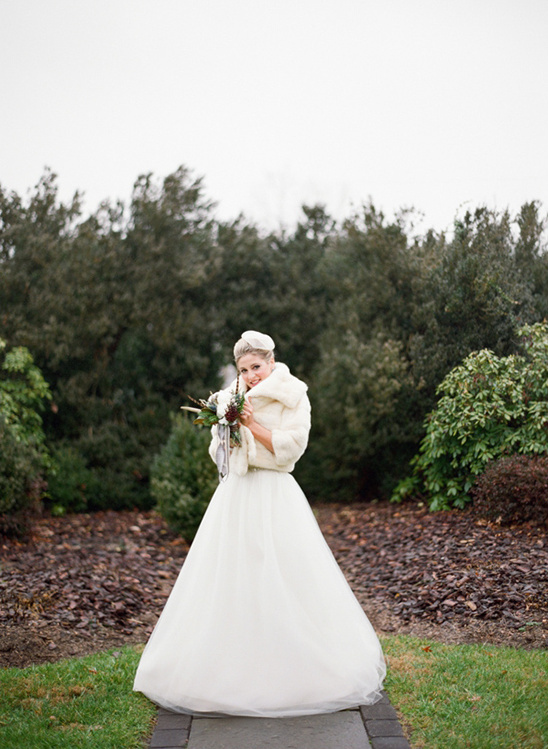 From Courtney of Dogwood Events:Our model wore an incredible dress by Amy Kuschel, a vintage fur jacket with monogrammed lining, a jeweled hair fastener and beautiful diamond and sapphire jewelry. 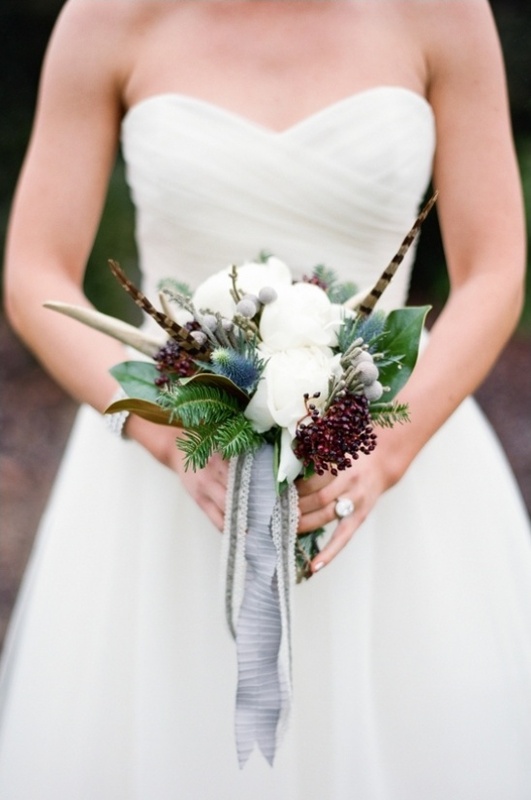 She carried a bouquet with white peonies, white ranunculus, silver brunia, berries, evergreen sprigs, magnolia leaves, pheasant feathers and antlers that was tied with silver ribbon, lace and rustic twine. 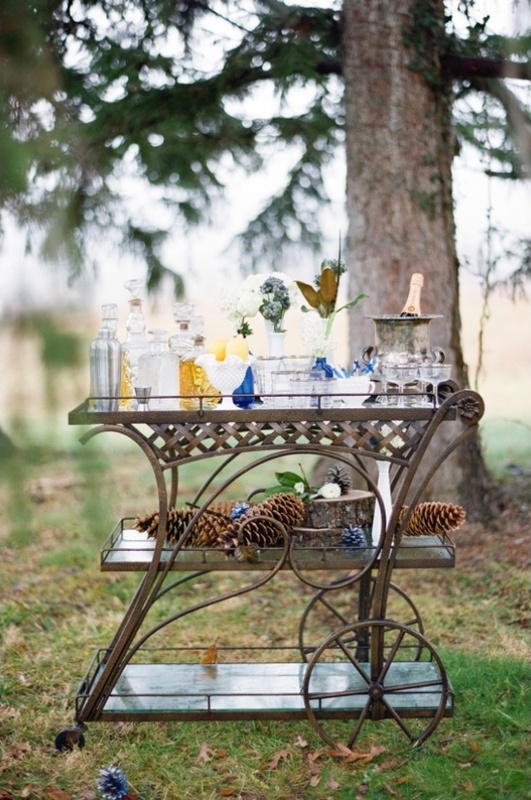 Our glass-topped reception table was set with silver chargers, white china with a platinum rim, white napkins with squirrel fur napkin rings, silverware with antler handles, silver champagne coupes and cobalt water glasses. 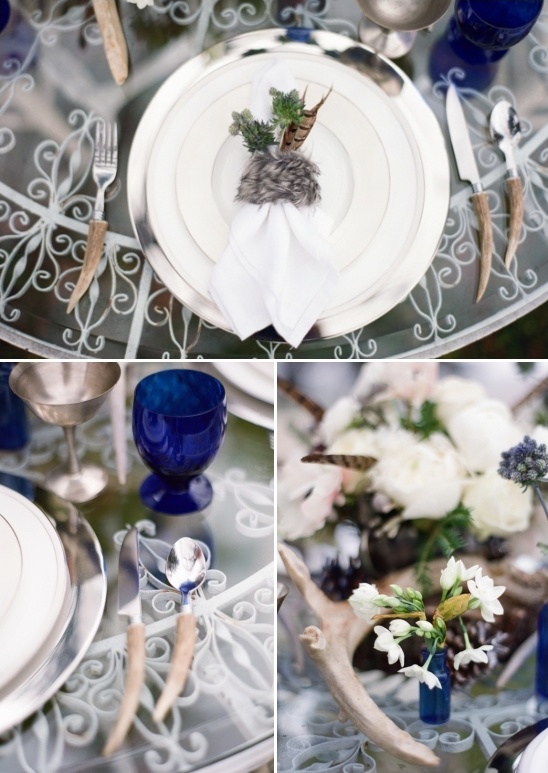 The center of the table was filled with loose antlers, antler candle holders, votive candles, pine cones painted blue and silver, wood slices, cobalt bottles and beautiful winter flowers in an antique silver bowl. 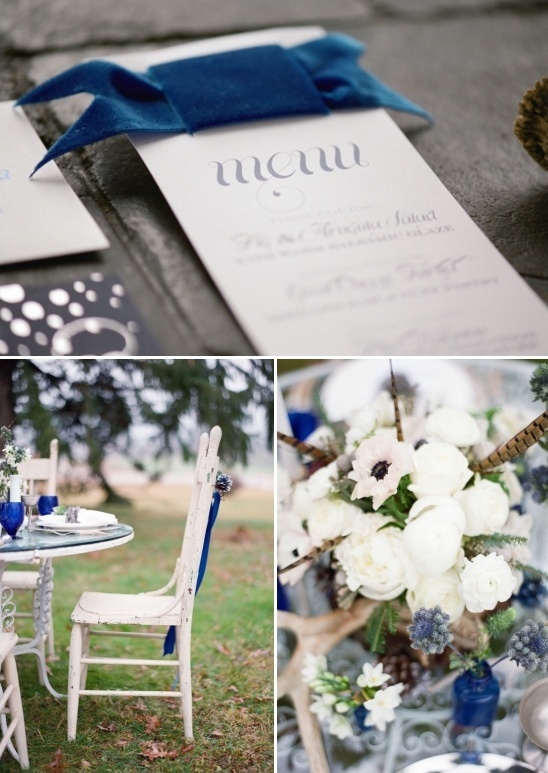 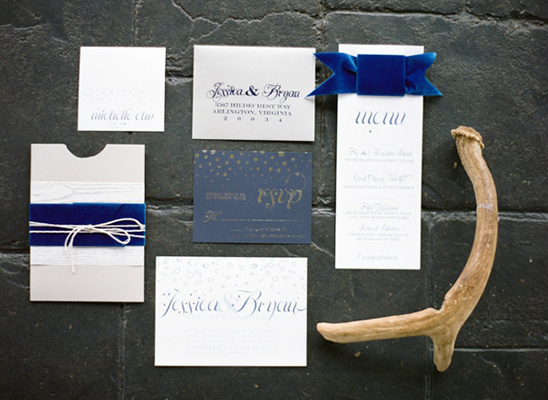 The wooden chairs were adorned with blue velvet ribbon, pine cones and blue thistle. 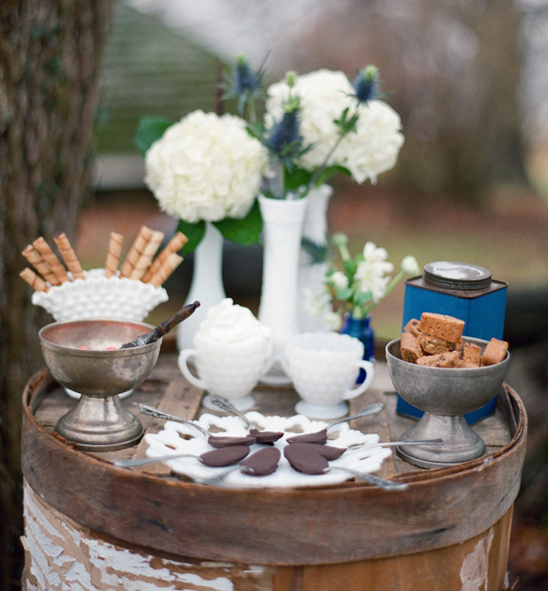 We set up a hot chocolate station on an antique coffee barrel that included chocolate covered spoons, whipped cream, miniature red pillow mints, homemade marshmallows, biscotti and chocolate cookie straws. 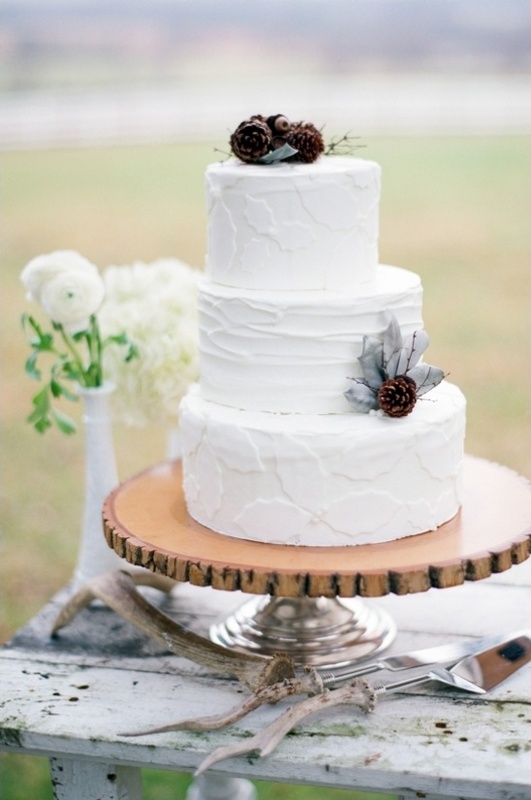 Our cake was covered in white fondant holly leaves and decorated with pine cones and silver holly leaves. 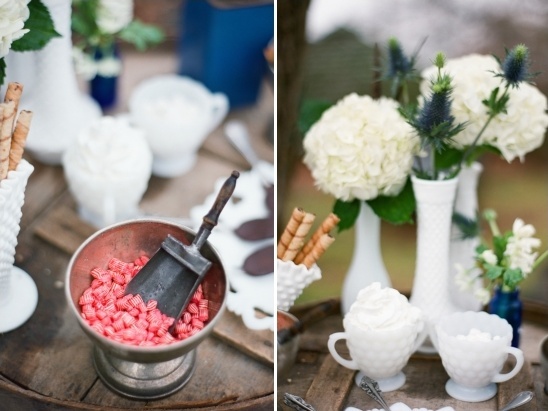 The cake was set on a silver cake stand topped with a slice of wood.